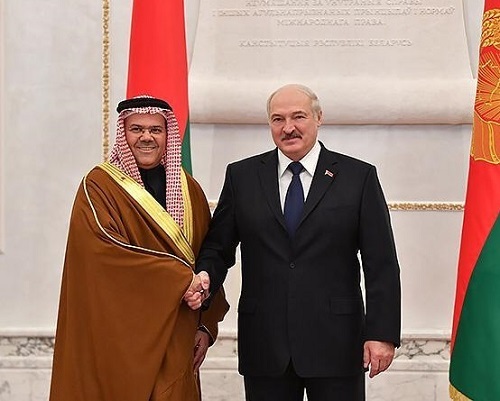 The President of the Republic of Belarus, Alexander Lukashenko received at the Independence Palace in Minsk, the credentials of Ahmed Abdulrahman Al Saati as the Ambassador of the Kingdom of Bahrain to the Republic of Belarus, residing in Moscow. Ambassador Ahmed Abdulrahman Al Saati conveyed to the President of Belarus the greetings of His Majesty King Hamad bin Isa Al Khalifa, His Royal Highness the Prime Minister, Prince Khalifa bin Salman Al Khalifa and His Royal Highness the Crown Prince, Deputy Supreme Commander and First Deputy Prime Minister, Prince Salman bin Hamad Al Khalifa, extending their well wishes for further progress and prosperity to the President and the Republic of Belarus. The Belarusian President expressed his pride and appreciation for the distinguished friendly relations between the Kingdom of Bahrain and the Republic of Belarus, and discussed ways to further develop these relations at all levels to meet the common interests of the two countries and peoples, wishing the Kingdom further progress and prosperity.